St. Martin’s Day, also known as the Feast of St. Martin, Martinstag or Martinmas, the Feast of St. Martin of Tours or Martin le Miséricordieux, is a time for feasting celebrations across Europe. In some countries, Martinmas celebrations begin at the eleventh minute of the eleventh hour of this eleventh day of the eleventh month (that is - at 11:11 am on November 11th). Bonfires are built and children carry lanterns in the streets after dark, singing songs for which they are rewarded with candy. At Dunquerke in France, children go through the streets with long chains of lights crawling on the ground to make noise, and the feast ends when the final song commands the extinguishing of all lights. Innsbruck’s traditional Christmas Market is set before the Golden Roof and surrounded by medieval house facades. On a stroll through the market with over 70 stalls, you will find Christmas tree decorations, arts and crafts and a few curiosities. A visit to the viewing platform over the hut rooftops or the enchanting “Fairy Tale and Giants‘ Alley” is an absolute must. Then round off your evening under the magnificent Christmas tree in front of the Golden Roof, with the traditional sounds of the tower trumpeters filling the crisp air each day and a mug of mulled wine warming your hands. Since the 1930s Saint Nicholas has been arriving in Amsterdam through the annual Saint Nicholas Arrival Parade. Known as Sinterklass in the Netherlands, he arrives at the Sint Nikolasskerk (Saint Nicholas Church) to usher in the Christmas season on a Sunday in November. The Saint Nicholas Arrival Parade features marching bands, elaborate floats, jesters, and acrobats throwing traditional Dutch sweets into the crowd. The Fira de Santa Llucia makes its home in front of Barcelona‘s cathedral and dates back to the 18th century. This Christmas market has become the most classic market in Spain to pick up all your festive decorations and gifts. The market is especially famous for its many stalls of mistletoe, Christmas trees and caga tiós. 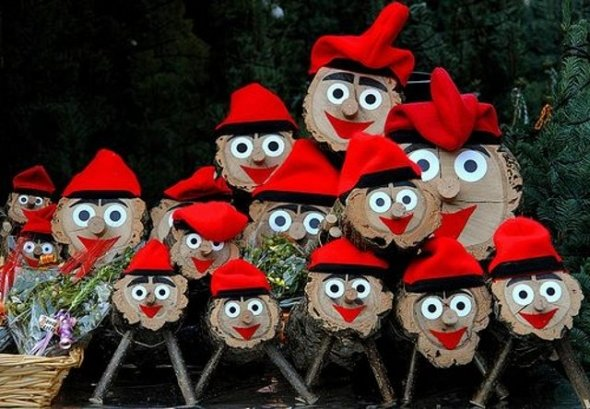 Caga tiós is a special tradition of Catalan Christmases and can be translated as “poo logs.” The log has a painted smiling face, and children take care of the log by covering it by a blanket or feeding it every day from December 8th to Christmas. That way, on Christmas Eve, the Caga tió will be sure to plop out lots of Christmas goodies. In 2014, Advent in Zagreb begins on Saturday, November 29th. The city lights up, the streets are crowed with people, and the sounds of street musicians, and the aromas of holiday foods fill the air. It’s a magical time in this old eastern European city. If you love Christmas, pageantry and the holiday spirit, pack your bags and head to Zagreb in December!